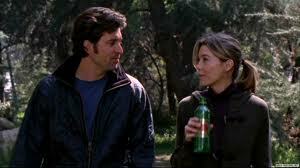 Meredith and Derek 310. . Wallpaper and background images in the Grey's Anatomy Couples club tagged: photo. This Grey's Anatomy Couples photo might contain sitka sparren, sitkaspar, picea sitchensis, beuken, beuken boom, beuk, berk, berken, and berken boom.